The unbreakable bond between the Ferrarini name and the Italian landscape and its ancient traditions goes beyond the borders of our area of origin. 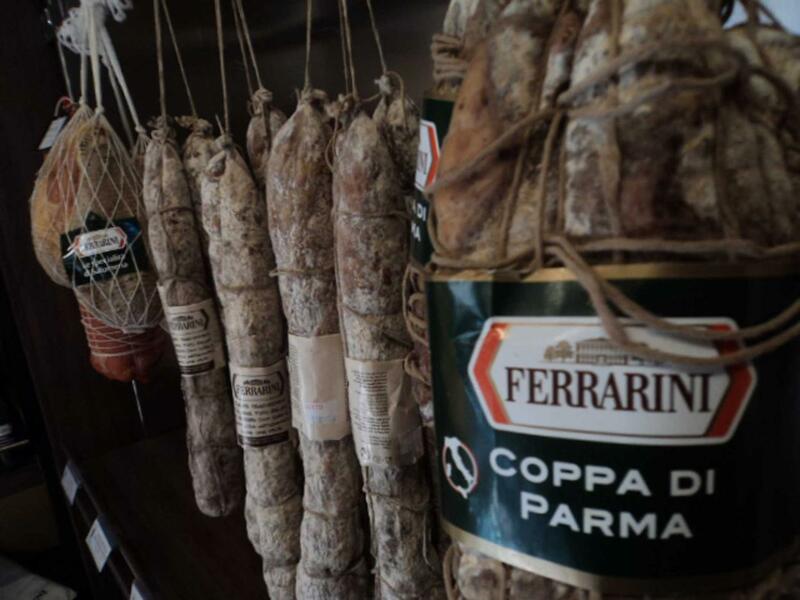 Along side traditional, Emilian delicacies, we also sell some of the most famous Italian cured meats. Seasoned Culatta, a cut taken from the finest section of pork thigh meat, must surely hold a place of honour among Ferrarini's delicacies, a secret hidden in the enchantment and fascination of the Emilian region. Seasoned Culatta is a portion of pork thigh meat that has the rind partially left on, in a gently elongated shell shape. Our range of cured meats includes the Coppa di Parma PGI ham and the Coppa Piacentina PDO ham, two traditional cured meats from the hills of Parma and Piacenza. Following delicate salting and careful drying, the meat is left to age for a long time, during which time the meat, as it dehydrates, takes on aromas and fragrances and its delicate, exquisite taste. The climate of these regions makes this cured meat a special and tasty product, appreciated by everybody. It is fragrant, tender and always delicious. The careful and meticulous selection of lean, solid and compact meat is accompanied every day by an art that has been passed down from father to son through the ages, the way the meat is trimmed and the skilful additionof natural flavourings. Its unique nutritional qualities make Ferrarini Bresaola PGI ham an ideal natural supplement. It is low in fat and rich in protein, iron, mineral salts and vitamins, as well as being very easily digestible, making it perfect for those who choose a lighter, healthy and balanced diet without compromising on taste. Alto Adige Speck PGI is an essential part of our range of cured meats, a delicacy from the renowned charcuterie tradition of Alto Adige, with origins that date back to 1200. A refined combination of spices, the slightly aromatic smoking and finally a slow ageing process give the speck its unmistakeable quality, the hallmark of something made with great passion. Where can you find the Seasoned Culatta and our other specialities? Enter your details HERE: we will send you an email with a list of all the nearest retailers that stock our cured meats. Still today, in the old Osterias of the Parmesan lowlands, the Seasoned Culatta is served with a certain ceremonious calm, accompanied by curls of soft butter, home-made bread, and a good Lambrusco.